You can find treasures that have been buried. Many others are locating them. A man using a metal detector located $300,000 worth of Revolutionary War payroll that was buried before a Torre raid. He first researched the story about the hidden payroll, and then set out to find it. In a small town in the Midwest a treasure hunter located $300,000 of silver certificates. The bills were buried by a well to do merchant. He had cached the money inside a large cast iron barrel that was dug into the ground and covered by a large flat rock. A husband and wife here in the East was told that the house they had just purchased, an early 1880’s Colonial, may have a treasure buried either inside the premises, or somewhere on the property. The married couple was remodeling the home, and as they were removing the old pine floors from a back room, they found approximately, $100,00 in gold and silver coins. The coins dated between 1810 and 1832. A farmer was plowing his field when he discovered to his amazement that he had scattered hundreds of old coins throughout his field. Apparently the coins were hidden in some sort of container that had broken from his plow blades. These are just a few of the stories of people finding treasures on their properties. In addition, I have been called to locate treasures for individuals who thought that perhaps their spouse or parents might have buried money or jewelry for safekeeping. After the spouse dies, or the parents pass on, if no one knows of the buried treasure, then that cache stays hidden, quite possibly forever. I have been fortunate enough to locate some of these caches for those families. To find treasures you do not have to be a professional, but you do need to research. It’s true that some individuals, like the husband and wife mentioned above, or that lucky farmer, do have treasures fall into their laps, but the vast majority of caches need to be researched. To give you an idea as to where to start your research, visit my page here. And, throughout this website you will find tips on how to locate buried and lost treasures. Every State has stories about buried treasures. Of course, some may be just a piece of fiction perpetrated over the years, but in fact, many of these stories have proven to be true. Treasure hunters have researched the stories further, and have located buried caches of all types. This page will give you a list of buried treasure stories of each State. Another area where buried caches both large and small are being located are in old ghost towns, but be careful, especially in the West and Southwestern States. Many of the old towns are on Federal Lands, and you will be breaking the law if you remove anything you find. In the Eastern States, there are many ghost towns as well, you can find treasures in these old forgotten towns. Today, the eastern ghost towns are no more than just cellar holes. However, they can be found with a little bit of research. For more information regarding old ghost towns visit here. 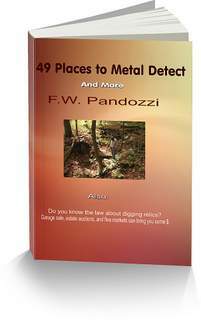 If you do not own a metal detector, and you want to find treasure, then you should have one. You don't have to spend a fortune either. A good model can be purchased new for between $350-$450. Stay away from the high-end models with all of the bells and whistles. Those detectors are for the more advanced user. If you study your owners manual, and you practice using your detector, you will become proficient at locating most items. Are you are interested in purchasing a metal detector or accessories? Find treasures with a metal detector. Visit my online store. Good Luck and happy treasure hunting!